Untalented Ed O’Neill (Al Bundy) 65th Birthday. 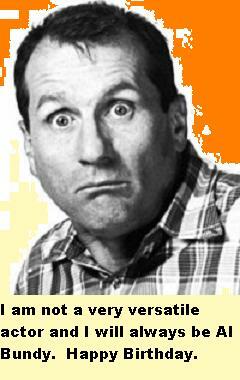 Home → Damien Zone → Untalented Ed O’Neill (Al Bundy) 65th Birthday. Overrated and untalented “Married With Children” star, Ed O’Neill is celebrating his 65th birthday today. The good news is that he can collect on Medicare and cash in his 401K, the bad news is that he is only famous in Germany where Al Bundy (unfunny) is an iconic funnyman. TheDamienZone thinks that O’Neill does not have appeal in the USA and that’s why he has not moved to character actor status. The rule is that if you’re famous in Germany you can never be famous in the USA simply because Germans have no taste. So if you become a big star in Germany, you better stay there. Look at Sandra Bullock — she left that frigging country and to this day they only know that she is a movie star who was born in Germany. They don’t really like her or go to see her in movies so as to suggest a trend out of proportion to her overall celebrity status. As soon as Germans start liking Sandra Bullock, she oughta pack it in. Maybe he just isn’t a good actor or something. Hey, it happens all the time. The Damien Zone is not down -- there's just a lot of traffic.